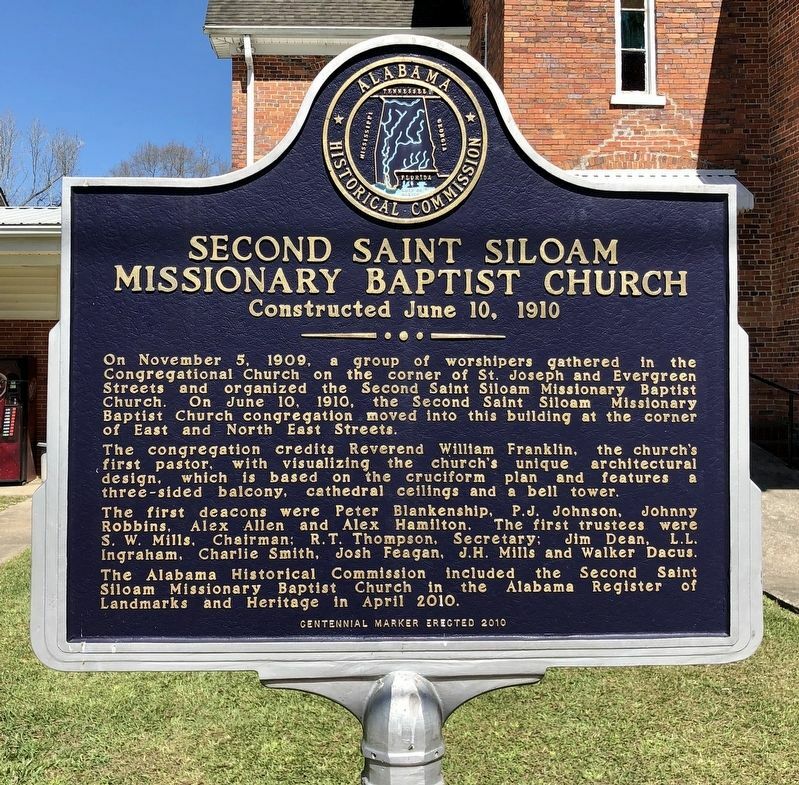 On November 5, 1909, a group of worshipers gathered in the Congregational Church on the corner of St. Joseph and Evergreen Streets and organized the Second Saint Siloam Missionary Baptist Church. 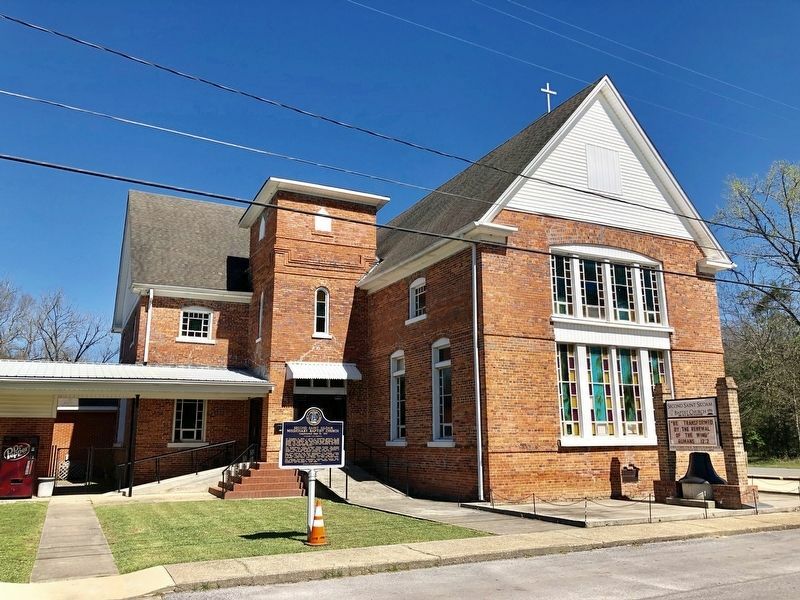 On June 10, 1910, the Second Saint Siloam Missionary Baptist Church congregation moved into this building at the corner of East and North East Streets. The congregation credits Reverend William Franklin, the church's first pastor, with visualizing the church's unique architectural design, which is based on the cruciform plan and features a three-sided balcony, cathedral ceilings and a bell tower. The first deacons were Peter Blankenship, P. J. Johnson, Johnny Robbins, Alex Allen and Alex Hamilton. The first trustees were S. W. Mills, Chairman; R. T. Thompson, Secretary; Jim Dean, L. L. Ingraham, Charlie Smith, Josh Feagan, J. H. Mills and Walker Dacus. 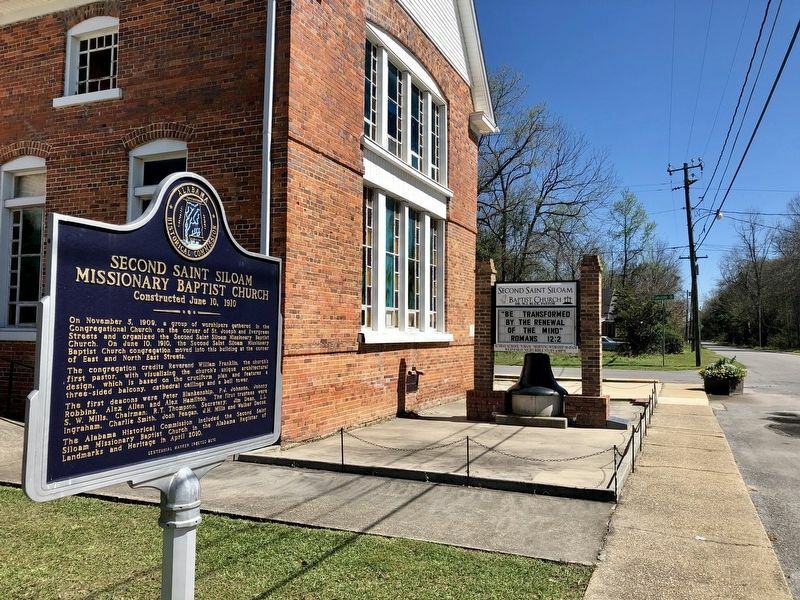 The Alabama Historical Commission included the Second Saint Siloam Missionary Baptist Church in the Alabama Register of Landmarks and Heritage in April 2010. Erected 2010 by Alabama Historical Commission. 31° 6.527′ N, 87° 3.871′ W. Marker is in Brewton, Alabama, in Escambia County. Marker is at the intersection of East Street and Northeast Street, on the left when traveling east on East Street. Touch for map. Marker is at or near this postal address: 126 Northeast Street, Brewton AL 36426, United States of America. Touch for directions. Other nearby markers. At least 8 other markers are within walking distance of this marker. Hart Station (approx. 0.4 miles away); Escambia County Veterans Memorial (approx. 0.4 miles away); The Leigh Place (approx. 0.4 miles away); Bank of Brewton (approx. half a mile away); The Robbins & McGowin Building (approx. 0.6 miles away); Ritz Theater (approx. 0.6 miles away); Burnt Corn Park Cistern (approx. 0.7 miles away); Downing-Shofner School (approx. 0.8 miles away). Touch for a list and map of all markers in Brewton. More. Search the internet for Second Saint Siloam Missionary Baptist Church.